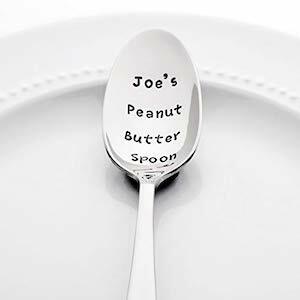 Wouldn’t it be great to have your own personalized peanut butter spoon when you eat peanut butter right out of the jar? No longer will you have to use a regular, everyday spoon for such an exalted task! This custom-made spoon is hand stamped one letter at a time and made with non-toxic ink. (We would certainly hope the ink is non-toxic!). The vendor suggests that if you choose to use your spoon you should wash it the dishwasher to avoid abrasive hand scrubbing to prevent the ink from wearing off. I’m not sure why you would buy a spoon if you do not plan on using it. Maybe at $25 (plus $10 shipping) you would want to keep it pristine, as a decorative item mounted on the wall with a souvenir spoon collection — but then again, with Comic Sans typeface, maybe not. Thank you to professional organizer, Hazel Thornton for bringing this unitasker to our attention. The goal of minimalism is not just to own less stuff. The goal is to unburden our lives so we can accomplish more. In The Minimalist Home, each room has a dedicated chapter, from family rooms to bedrooms, from outdoor spaces to hobby spaces, and even spaces dealing with family pets. Within each chapter there are sections on defining the vision and goals for the space, implementing a step-by-step plan, and reflecting on possessions to include items that tell your family’s story. 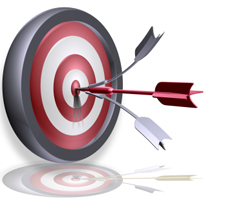 There is a “minimizing checklist” at the end of the chapter so readers can ensure they have reached their goal. The Minimalist Home also includes maintenance guides — from daily maintenance like putting away the mail and dishes, to yearly maintenance such as spring cleaning and filing income taxes. This book has no glossy photos nor examples of the latest home décor trends. As a matter of fact, Becker does not propose rules on how much of each item to keep or toss. He encourages the reader to analyse his/her lifestyle and minimize to that level. It is a very nice change because so many books about minimalism make the readers feel that they are keeping too much or shaming them for feeling sentimental about souvenirs or heirlooms. …minimalism doesn’t guarantee that you can find meaning and significance in life. But it does, almost always, open your eyes wider to these issues and create a context where you can think through them better. If you are looking for help to define your vision and set goals, to work together as a family to create a welcoming home that is your ideal of comfort, that nurtures your passions, The Minimalist Home is the book you need. Today’s unitasker is Snap-on bedding labels. These simple to attach, snap-on labels that tell you the size of bed sheets. For about $16 USD, you get four labels. I’m assuming one for each of the flat sheet, fitted sheet and both pillow cases. You buy different colours of sheet sets for different sizes of beds in your home and put a colour-code chart in your linen closet to remind people which colour of sheets are which size. You only have one size of bed. All of the sheets would be the same size regardless of colour. You use the same colour of sheets for all the beds but launder the sets of sheets on different days and store the sheets for the bed in the room in which the bed is located so they don’t get mixed up in the linen closet. You use the same colour of sheets for all the beds but you own a Sharpie permanent marker and decide to write a small letter in the corner of each sheet/pillowcase indicating what size it is. If you do not do any of the above, and have not read our article on how to best store your sheets, feel free to purchase the Snap-on bedding labels. 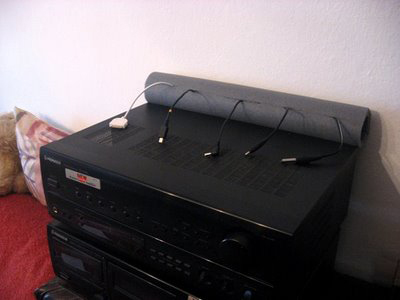 We’d like to thank reader Ann J. for alerting us to this unitasker! At first glance, The Real Simple Method to Organizing Every Room is like many other organizing books. It has information about uncluttering and some nice glossy pictures. A streamlined home is like a symphony with pieces that work together. Instead of assigning items specific roles and hoarding junk in a drawer, imagine that your home is a boutique where everything works together. The uncluttering and organizing instruction they give is relatively standard — group your items together, decide what stays, and eliminate what you no longer want or need. They furnish a great list of options on where to donate most items. I like their suggestion of labelling bags of raggedy clothes as “unsuitable for resale” so charities can sell them directly to textile recycling without wasting time sorting through them. The Real Simple Method suggests that readers practice small, simple habits that make a big difference in the look and functionality of the home. This way they only spend a few minutes each day doing housework rather than spending most of the weekend moving things from one pile to another. There is plenty of useful advice on how to get family members involved in a positive and productive way (no bribery or coercion involved!). Throughout the book there are beautiful, glossy, eye-pleasing photos — and they are realistic. The closets and drawers are full of clothes. The rooms have a typical amount of normal-sized furniture and there are colours! So many home décor magazines I have seen use scaled-down furniture, have only a few items of clothing in each closet or drawer, and the colours range from white to beige. The Real Simple Method is a nice change! In the book, each room is assigned its own chapter. Within each chapter there are suggestions about how to make the room functional. For example, the experts suggest that the most efficient way to organize is to make sure the room is arranged to allow you to move through it freely without crisscrossing. 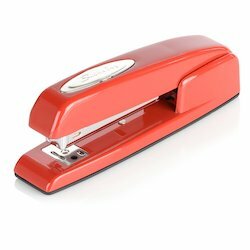 This will help you perform tasks in an orderly manner. Each chapter contains a list of the tools (furniture, stylish storage items, etc.) for the suggested look and functionality of the room. There is also a section within each chapter that gives alternatives for small spaces — great for those who live in apartments and small homes. The experts also include a checklist for tidying if you have five minutes, 15 minutes, one hour, or a whole weekend and provide time-saving tricks on to how to keep the room organized and clean with minimal effort. For each room, they take one clutter problem area that most readers have difficulty with such as the junk drawer (kitchen), handbag (bedroom), or shelving (living room), and do an in-depth exposé into how to conquer the chaos and create a functional stylish space once and for all. There is a guide for hanging wall art, a list of ways to set your table incorporating colour and style elements, and suggestions on how to store your fine dinnerware and stemware dust-free so you can be ready to entertain in minutes. From indoor spaces to outdoor spaces, from kid spaces to pet spaces, this book covers it all. 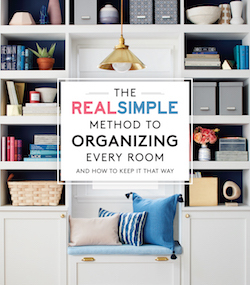 If you are looking for a book that not only provides useful organizing advice but helps you create and highlight your own style, all while doing less housework, check out The Real Simple Method to Organizing Every Room. This is the second in a two-part series on how you can use a deep freezer to help with meal planning. As I mentioned yesterday, we see meal planning as the best process for planning healthy meals, creating a simple shopping list, and avoiding the stressful “what’s for dinner” moment in front of the open refrigerator. A meal plan helps to keep clutter out of your body, and streamlines your at-home eating. 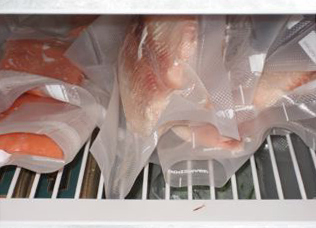 One of the ways you can use a freezer to help with meal planning is by vacuum sealing foods you buy in bulk. 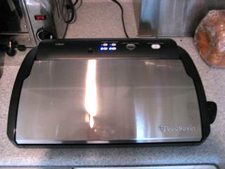 If you don’t own a product like a FoodSaver Vacuum Sealer, using freezer-safe zip-top bags and squeezing out as much air as possible can work as well. To get the air out of a zip-top bag, close the bag except for an inch at one of the corners. Submerge the exterior of the bag in water almost to the top of the bag. Let the pressure of the water release air from around your food, and then quickly close the last inch at the top of the bag. Be careful not to let any of the water into the bag and onto your food. The way we use our FoodSaver is pretty straightforward. We start by buying fish filets, beef filets, chicken breasts, roasts, ground turkey, some pork cuts, and usually one or two other meat items based on what is freshest at our butcher’s shop. (If you buy half a cow from a CSA or another animal in larger portion, ask to have the meat butchered for you. My butcher does the vacuum sealing for his customers for a small fee.) Then, we head to our farmer’s market or grocery store and pick up some lettuces and other vegetables that are in season. We buy what we know we like and will use in the next three months. After shopping, we go home and divide everything up into meal-size portions (we’ll put two fish filets in one vacuum bag, for example). We seal up the storage bags, adhere a piece of masking tape with the date written on it, and throw them all in the freezer. Well, except for the vegetables we want to eat fresh and the lettuces. Lettuces should never be frozen — you don’t want to freeze vegetables with high water content. When you put meat into their bags, you also can add marinades in with the food and they can absorb flavors during the time in the freezer. When I create my meal plan, I “go shopping” in my freezer and see what I have and what meals I can create from the food in the freezer. I write down what meat I need to pull out of the freezer and transfer it into the refrigerator to thaw two days in advance. (Never thaw meat or fish on the counter.) Vegetables I usually don’t thaw ahead of time. How do you use your freezer to keep meal planning simple? I’m looking forward to getting our deep freezer and having the convenience of being able to buy more in bulk than we already do. This is the first in a two-part series on how you can use a deep freezer to help with meal planning. Eating nutritious food is essential for my health. If I eat more than two high-fat, low nutrition meals in a week it takes longer for me to heal after injury and my energy level plummets. For most of us, more than two high-fat, low nutrition meals in a week also adds unwanted pounds and can mess with our hearts and arteries. The easiest way I’ve found to keep on track with healthy eating is to have the majority of my meals at home where I can control the ingredients. On Unclutterer, we’ve written in the past about how to make eating at home easier with meal planning techniques. The process allows you to plan for healthy meals, create a simple shopping list, and avoid the stressful “what’s for dinner” moment in front of the open refrigerator. Since our meal planning article initially ran, I’ve received dozens of emails asking if we use a deep freezer in addition to the refrigerator/freezer we have in our kitchen. We currently don’t have one, but it is something we discuss a couple times a month. One of the questions we’ve been trying to answer is if the expense of the deep freezer plus the cost of the electrical energy to run it is less than the amount we spend buying in smaller portions and driving more frequently to our butcher and local market. So, to start off our brief series on using deep freezers for meal planning, I want to address my initial question of cost. Is it financially prudent to own and use a deep freezer? The commonly purchased model chest style deep freezer is around $600. Upright freezers cost considerably more than chest freezers. If we were to buy one, we would go for a small chest freezer (under 10 cu. ft.), which has an MSRP of about $300. Most freezers use between 100 and 400 W of power per day. This translates to roughly $175 of electricity per year depending on the size of freezer and your electricity rates. I would have a difficult time justifying the expense of a larger freezer solely based on convenience. But, if I lived in a rural area and shopped less frequently, had kids and more mouths to feed, then the increased costs would be reasonable. To get a good comparison of food prices in bulk versus smaller portions, I want to look at the price of beef. I know not everyone eats beef, but I had to pick something to compare and beef figures are easily obtained. I purchase my beef from an organic butcher who gets the majority of his stock from regional farms. In his butcher shop, I can order half a cow twice a year (butchered and vacuum sealed into meal-size portions) or I can make weekly trips into his shop to buy cuts of beef as I need them. Half a cow roughly translates to about $5 per pound, and beef I buy on a weekly basis usually starts at $5 per pound on sale and can be as much as $30 per pound for premium cuts. Without argument, it is cheaper to buy half a cow and freeze the bulk meat than it is to buy weekly. Even if you don’t buy your meat from an organic butcher and pay grocery store prices, you’ll still spend more than $5 per pound for a cut of beef. Ultimately, the expense of a deep freezer plus the cost of the electrical energy to run it is less than the amount we’re currently wasting when we buy our food in smaller portions. My final answer is that it is financially prudent for us to purchase a deep freezer and buy in bulk.